This week Awesome Stories brings you the gift economy, patient-centered healthcare, photography, cancer support and clear solar cells. I’ve been tempted to live via the gift economy as do a growing number of people like Brice Royer. Brice has been working to heal his stomach cancer for about three years. One of his insights was how environmental causes are at the root of most cancers. 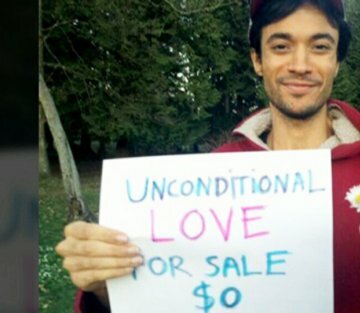 He decided to step out of the money economy as part of his healing journey. I admire Brice’s dedication to both healing and living based on giving rather than buying what we need. You can read more of Brice’s story and how he is part of a larger gift economy in Canada. BJ Miller is a doctor who started his journey as a patient who nearly died from electrical shock. He had 11,000 volts run through his body by touching a live wire on a commuter train. What I appreciate is his candor about both the amazing benefits of modern medicine and the crippling effects of many of our current systems. He is dedicated to bringing more care into healthcare by focusing on people and care rather than disease. Much of his learning and work is done with palliative care offered at Zen Hospice where he is helping to shift the focus from disease-centered to patient-centered care. Watch his heart-felt TED Talk below. I really relate to this story. Photography has certainly helped me learn to see the world differently. Learning to notice and appreciate the beauty around me. Paul Van Slambrouck is a journalist and photographer who has refined the way of looking at the world through his photography hobby. Paul reflects on how he gradually learned to notice more and more detail about life (inner and outer) by making a ritual of photographing the scene outside his window. Read more about Paul’s reflections on seeing. Transparent solar cells have been the holy grail of solar research for years. The idea is to allow sunlight to pass through the panels yet capturing the solar energy as the sunlight passes through the solar cells. Scientists at Michigan State have taken a different approach with solar concentration. They use organic salts to gather and guide the solar energy to the edges of the panel where traditional PV cells turn the sunlight into useable energy. They are hoping for efficiencies in the 5-7% range which doesn’t sound like much until you realize that every window could become a potential solar collector. Singleton Moms is a Phoenix based non-profit that helps single parents who are dealing with cancer. After watching a friend struggle with all the challenges of cancer while trying to raise children as a single parent, Jody Farley-Barens started Singleton Moms to help and honor her friend. Since 2006, Singleton Moms has provided physical, financial and emotional support to over 300 familes, providing things like childcare, meals, house cleaning and paying bills. Their mission is to nurture the familes while offering practical support and hope for the future. Jody has been featured as a CNN Hero for her work. May your week be full of awesome stories! Uplifting and inspiring stories, Brad. Thank you. We humans are capable of so much, it does make me think that we are indeed God’s hands on earth. Great perspective Dave. Photography is a way of helping me slow down, look for beauty and savor life. to awesome days that we photograph or at least savor! Yes, I’m enjoying food and friends in NW Arkansas, US. 🙂 Thanks Mitza. Very thoughtful reply Michael. If we lived from love, sharing our resources, we might not need money and many of the current systems. Your awesome stories bring hopes and positive thoughts! Thank you!! You’re welcome Indah, I hope your week is full of awesome stories and adventures!